The 2007 growing season was preceded by a wet winter that replenished water reserves after four hot, dry years. The humid conditions continued into spring and early summer with lower than average temperatures combined with periods of rain. There were no significant periods of intense heat during the summer months. This ensured that the leaf canopies were in an exceptionally healthy condition and able to benefit from the warm weather that preceded the harvest. The first two weeks of September saw constant daily temperatures of between 35ºC and 38ºC. These warm and dry conditions brought the crop to perfect maturity, advancing the production of sugar and phenolics while retaining the excellent natural acidity resulting from the relatively cool summer. As a result the harvest produced perfectly balanced musts which have produced stylish and elegant wines, full of vitality, with a superb fresh concentrated fruit character. 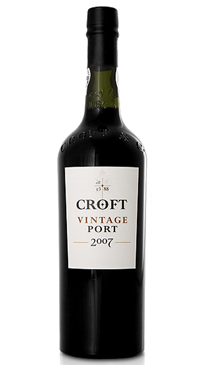 There is a nice limpidity on this Croft 2007. It is not the power that strikes you but the purity with black cherries, liquorices, violets and a hint of iodine. Very tight and focused. The palate is full-bodied with chewy tannins on the entry, pure blackberry, raspberry, white pepper and Asian spice towards the finish. Very fine focus, very pure and harmonious. Sensuous finish but it just tapers away when I need more grip and assertiveness. Still, this is a lovely Croft.